As I mentioned at Christmas, I was really impressed with the material I found on the Fulton History website. I’m still not done going through all 60 articles/images, and fully organizing them, but I did find some real gems. 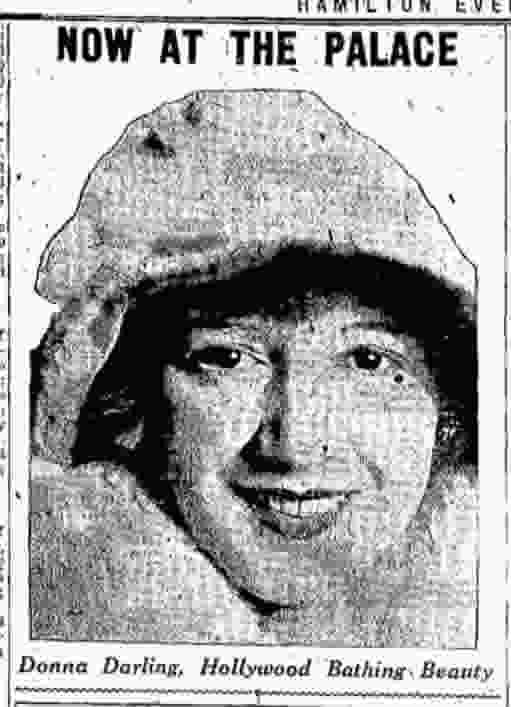 One of the best was a never-before-seen front-on photo of Donna from 1925. It is amazing how much mom looked like her when she was young. Anyway, the article indicates that Donna was playing at the Palace in Hamilton, OH as a headliner. 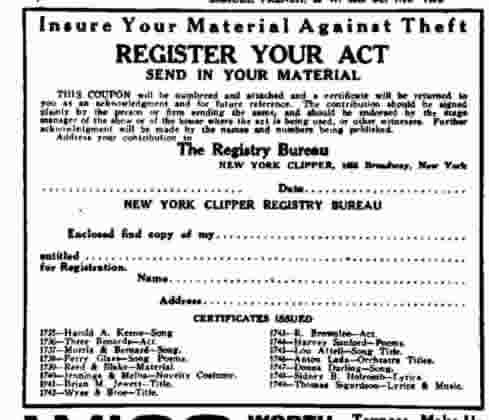 The other big find was the New York Clipper had a service where you could register your act, song, etc., with them. They did it as a service to the vaudeville community. I found references to Donna having registered a song with them. Her name shows in several different issues of the Clipper that she registered a song and was issued a certificate of registration. Interesting…. I wondered what she had registered with them. Was it the song I knew about or was it something entirely different? What was certificate 1767 issued for? I found out that the New York Clipper began in 1854 and was absorbed by Variety in 1924 (1). That is why I quit seeing Clipper articles about Donna and started seeing Variety articles. I also learned that Variety is still in publication. I then began searching for references to the registry. I quickly found that Emerson College has a document, The New York Clipper Vaudeville Registry Collection which listed her certificate and her name and they have the collection. Amazing. Apparently, the Registry was located in two file cabinets at the Variety offices in Los Angeles. An archivist from the Margaret Herrick Library of the Academy of Motion Picture Arts and Sciences came across the documents that were about to be thrown out. Although it wasn’t something that fit within their archival scope, they thought it best to save the collection and find a permanent home for it. They finally found a home for the collection at Emerson College and they were transfered there in 2011. I understand that four interns went through the material and catalogued that collection. Apparently, the task was complicated because many of the items were “protected” by being wrapped in another layer of paper that was highly acidic. They published a finding aid about the collection in May 2012. The collection was saved and, most thankfully, Donna’s submission was there. 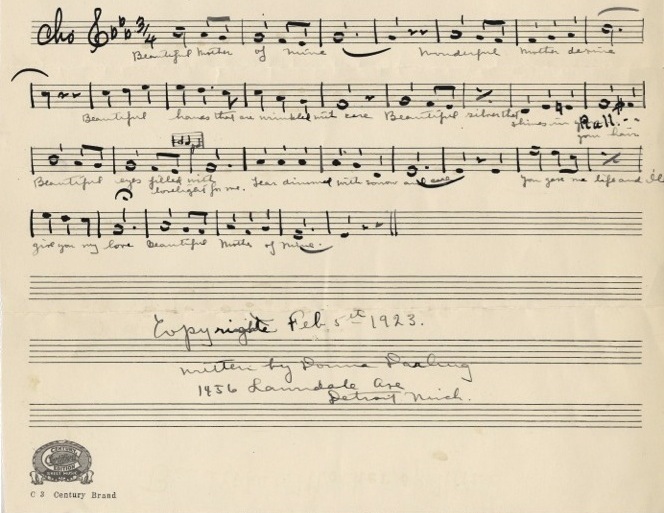 After talking with the director, I was able to get a copy of the music and the forms that Donna Submitted in February 15, 1923. 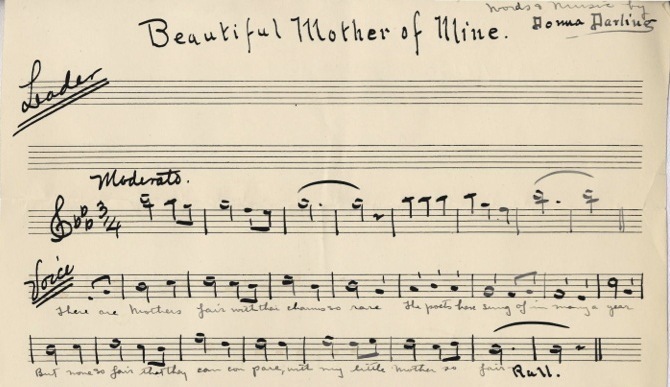 Hear the song – Performed by Russell, Donna’s Son. Thank you to the old New York Clipper for providing the original service, Variety for keeping the material for so many years, the Margaret Herrick Library of the Academy of Motion Picture Arts and Sciences for saving the material from destruction, Emerson College for accepting the material into their collection, and archivist Christina Zamon for making the material available. Box 20, The New York Clipper Registry Collection, Emerson College Archives, Emerson College, Boston, MA.